Samsung announced the Galaxy A30 and A50 last week. 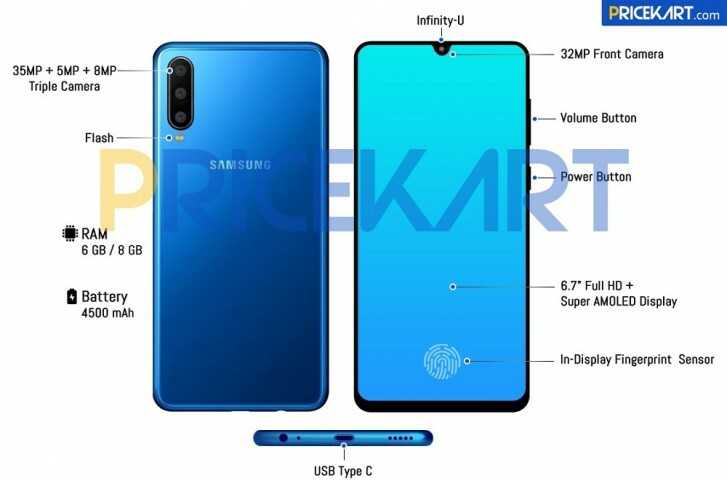 A Galaxy A40 should be joining them soon as well as a Galaxy A60 - the latter's specs leaked yesterday and today we are treated to its renders, which confirm its design. The Galaxy A60 looks similar to the A50. It has the Infinity-U display on the front with triple cameras stacked vertically in the top-left corner on the back. However, edges on the back of the A60 seem to be flatter than those of the A50. The render also shows a USB Type-C port at the bottom of the smartphone which is flanked by a 3.5 mm headphone jack, a microphone, and a speaker. The power and volume buttons are located on the right side of the phone. There's no fingerprint scanner on the back or either sides of the A60 though as it's placed under the display. The source has also revealed some specs of the Galaxy A60, which are in line with the ones we saw yesterday. However, today's leak suggests the phone will come with a 35 MP primary camera at the back, whereas the specs sheet leaked yesterday said this would be a 32 MP sensor. Today's leak also reveals that the 5 MP camera at the back is a depth sensor with the 8 MP camera coming with an ultra-wide angle lens. The Galaxy A60 will be powered by Snapdragon 6150 SoC which will be paired with 6 or 8 GB RAM. The smartphone will run Android Pie with One UI atop, and will have 128 GB of storage onboard. Another plastic phone. Where are the metal unibodied phones? We don't know the price yet. All of these are the video old A models with a zero on the end, so we'll wait to see if Samsung price it right but I'm sceptical.